There’s just something about a fun, colorful llama that makes you feel good! 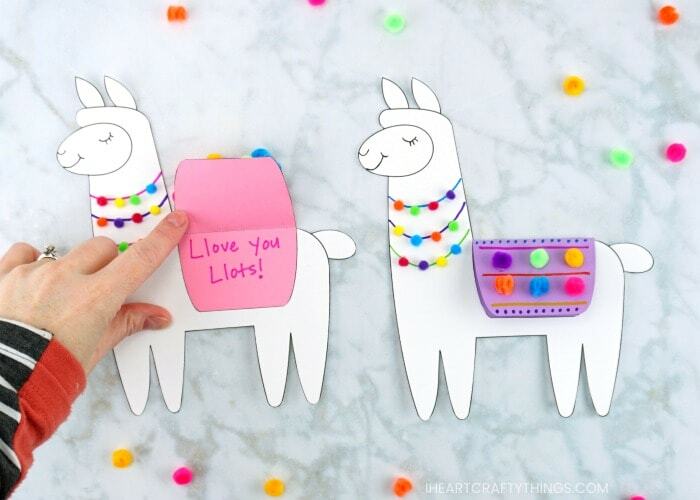 If you feel this way too, you are going to love this Llama Valentine Craft we are sharing with you today. In this post, learn how to make this sweet Llama Valentine Card with our helpful template, step-by-step tutorial and video. 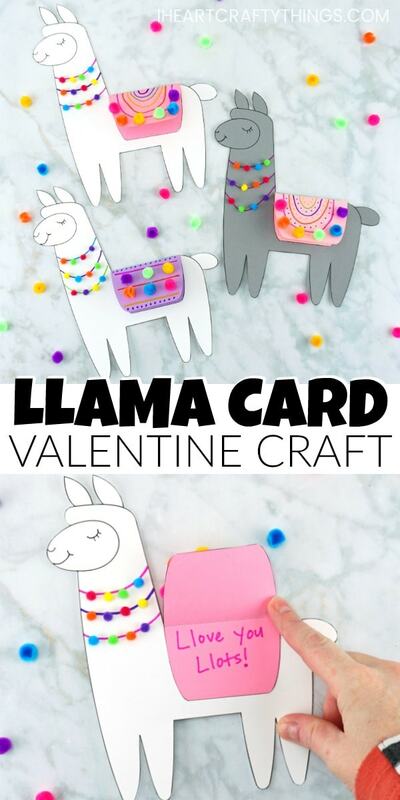 While we made this craft for Valentine’s Day, this fun llama card could also be used for Mother’s Day or any time of the year you want to pass along a smile to someone. 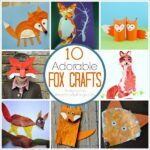 We went traditional with our white and gray llamas but you could let kids get creative with brightly colored llamas too. 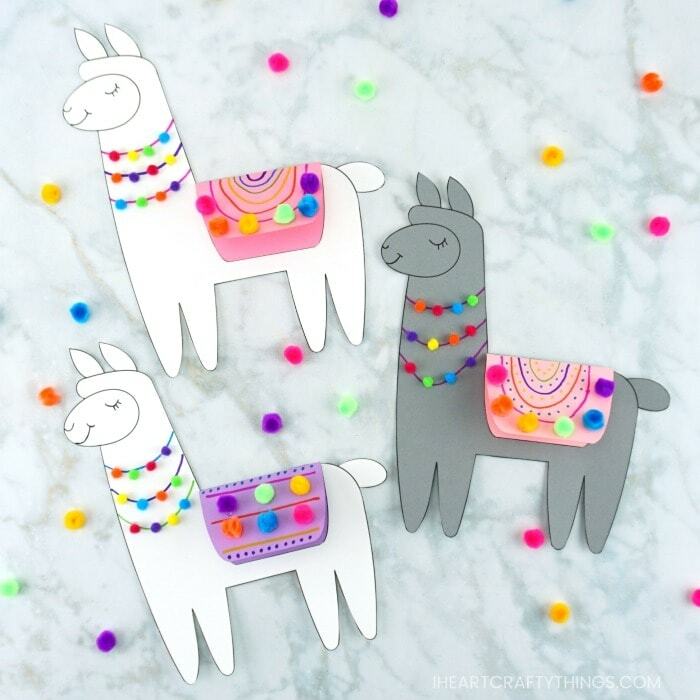 Let’s get started on making our llama Valentine craft! 1. 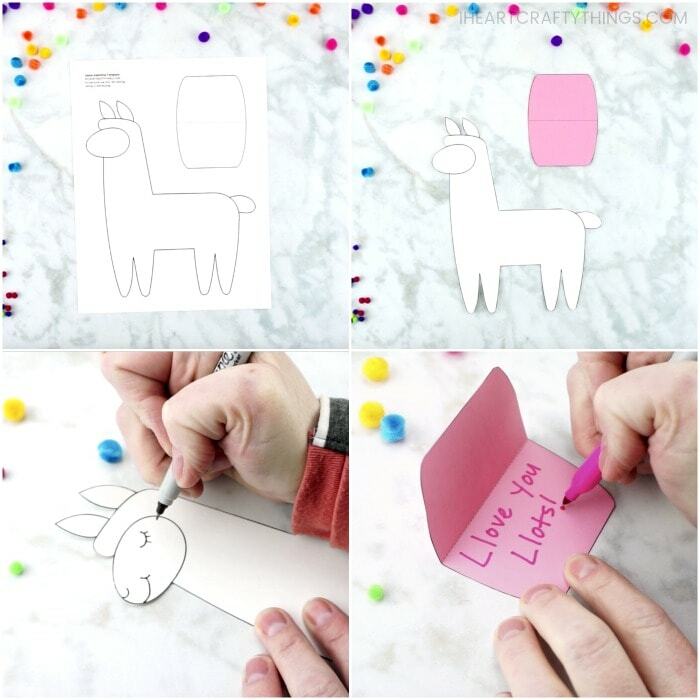 Begin by downloading and printing out the Llama Valentine Craft template on your white cardstock paper. The first page of the template has both of the llama pieces for the craft. The second page has four cloth pieces so you can print them out on colored paper if you choose. You could always have children color in the white version too. 2. Cut out the two llama pieces. In our example below we printed out the cloth piece on pink cardstock and cut it out. 3. 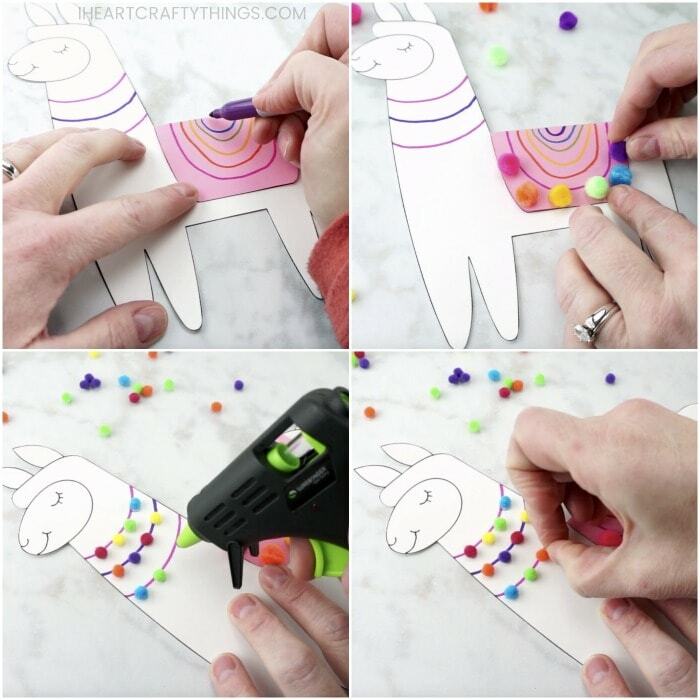 Use a fine tip black marker to draw a nose, mouth and eye on your llama Valentine craft. We drew our llama with it’s eye closed and eyelashes but you can draw an eyeball, or even use a googly eye if you’d like. 4. Take the llama cloth piece that hangs over his back and fold it in half along the dashed line on the template. This turns it into a fun card for the front of your llama craft. 5. Use a marker to write a special message on the inside of the card. We used “Llove you Llots!” for a fun play with the two l’s in llama. We also used “You’re Llama Fun!” in another one of the cards. 6. Add glue to the back of the card and glue it onto the llama’s back. 7. Use your markers to draw rope lines around the llama’s neck and some designs on the front of the cloth your just glued on the back of the llama. 8. Use a low temperature hot glue gun to glue small poms on the front of the llama cloth on his back. Then glue your extra small poms on the rope pieces around the llama’s neck. Don’t you think they are adorable?! As we mentioned in the beginning of the post, these cute llama’s don’t need to be limited to just Valentine’s Day. They would make a sweet Mother’s Day card for kids to make for their Mom or Grandma. You could really make them any time of year just to put a big smile on someone’s face. 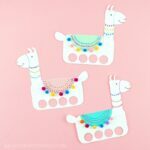 Another alternative for this Llama craft is to omit the card aspect of it and simple glue the cloth section on both the front and back of the llama back. 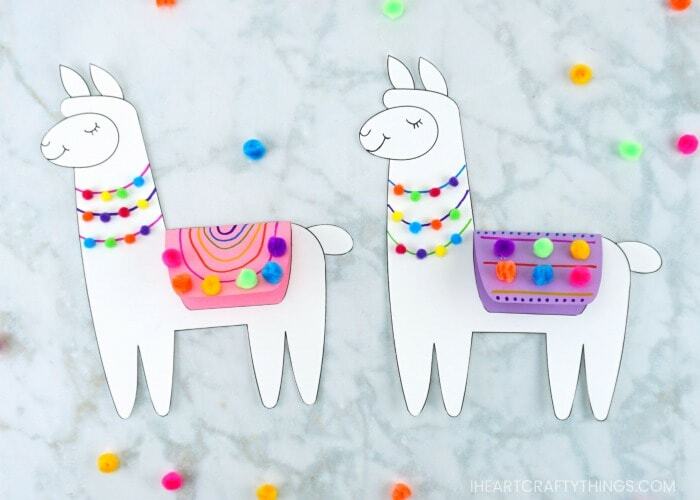 Then you can decorate both sides of the llama to make it more two-dimensional. 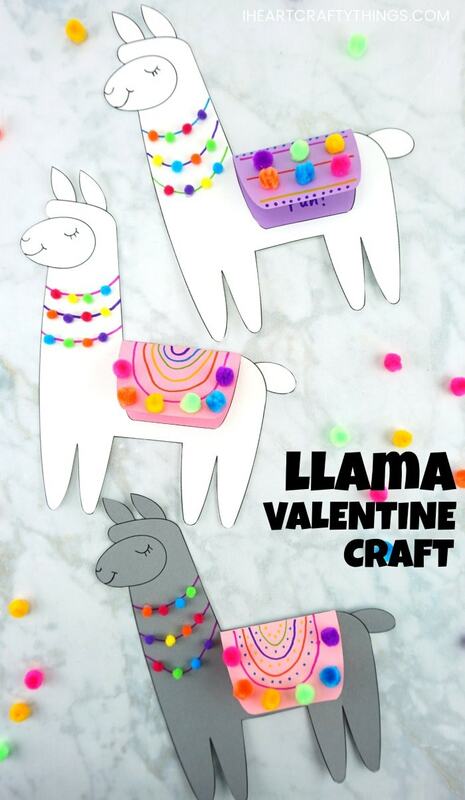 Watch the video below to be guided through each step of this Llama Valentine Craft. This 3D Hot Air Balloon Card is another fabulous homemade Valentine card kids will love creating. We have a handy template for the heart air balloon so prep is easy, peasy. We can’t get over the cuteness of our new paper sloth craft. The heart theme makes it a perfect craft for Valentine’s Day. 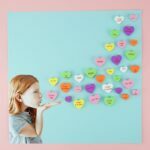 This Blowing Hearts Valentine Craft idea might be the cutest thing I’ve ever seen! The personalization with the child’s photo blowing the hearts off their palm makes it a darling keepsake for parents or grandparents to treasure forever.